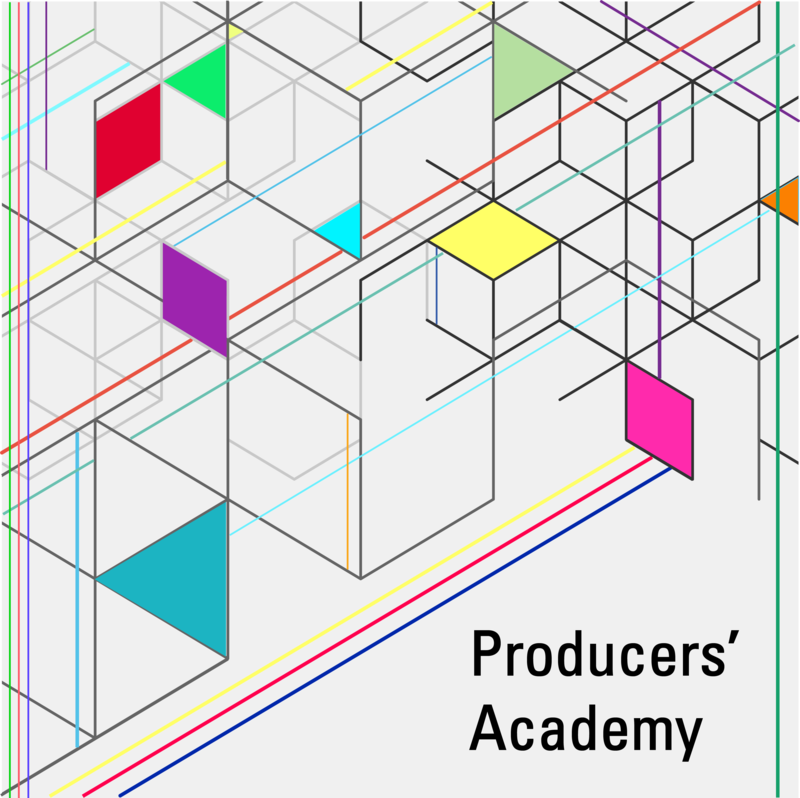 The Producers' Academy is back for a third edition, with an international training program focused on entrepreneurship for European producers working in the performing arts. Looking for the Procuder's Academy 4 (2019)? This way! 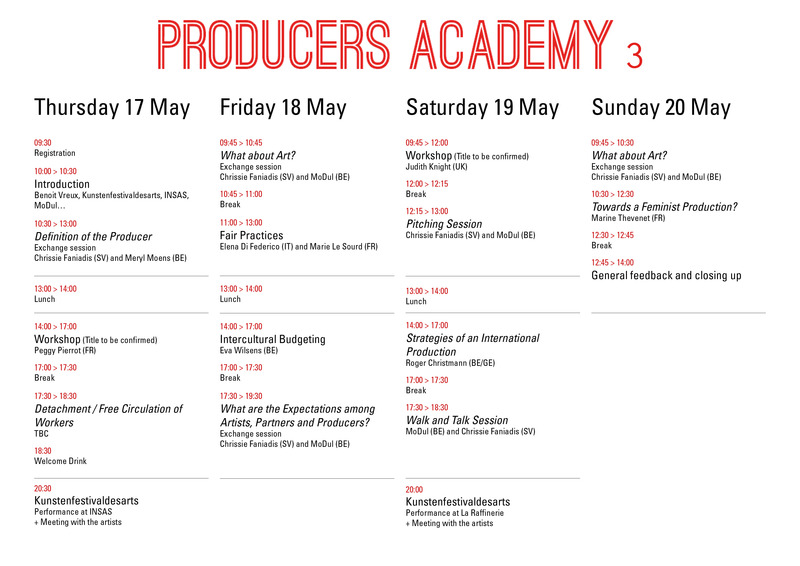 The 3rd edition of the Producers’ Academy proposes a global reflection on how professional producers can deploy their skills as cultural ambassadors. Throughout the programme mixing workshops, case studies and round tables, participants will be invited to question their own practice through several philosophical and political filters. This year, the sector will be specifically approached through the prism of care, one of the fundamental concept of feminism. The workshops will be held exclusively in English. Lunch will be served every day. Registration is free of charge, participants will be selected upon application. The Producers Academy is a project by CIFAS, MoDul, On the Move and Kunstenfestivaldesarts. Click on the image above to have an overview of the programme. The Producers’ Academy 3 will take place at the National Institute of Performing Arts (INSAS), one of the centres of Kunstenfestivaldesarts 2018. - The event will be held exclusively in English. Therefore, participants need to be able to understand, communicate and work in English. - For non-EU based / nationals' applicants who need a Schengen visa and/or do not have any funding for their travels in case of selection, please send your application as soon as possible, at the latest on 15.03.2018. * We can send official invitation letters to those who wish to activate ways to support their participation costs. We, and our partner On The Move, will be happy to provide advice and guidance about available mobility support programmes. On the Move is the cultural mobility information network active in Europe and worldwide. On the Move posts on a free, regular and updated manner funding opportunities for the mobility of artists and cultural professionals – all disciplines covered – in Europe and worldwide. Thanks to its members’ and partners’ expertise, On the Move also shares information on key challenges related to cultural mobility (eg. visas, social protection, taxation, environmental issues). Beyond this information channel, On the Move facilitates training, workshop and/or makes public presentations on cultural mobility issues. It also advises on internationalisation of practices and organisations in partnership with cultural bodies, agencies, networks, foundations etc. The On the Move network has recently started to work on evaluations and impacts’ studies related to artists’ mobility. On the Move is one of the partners of the EU funded project, Creative Tracks together with KEA European Affairs, Visiting Arts, Inovamais, Addict, Librios, Roberto Cimetta Fund and Baltan Laboratories. Conditions Free of charge, under application (see conditions above).